Emily the Strange made her first appearance in a graphic novel, and the franchise now includes novels, artwork, toys, clothing, and “accessories” ranging from jewelry to footwear to a Zippo lighter. 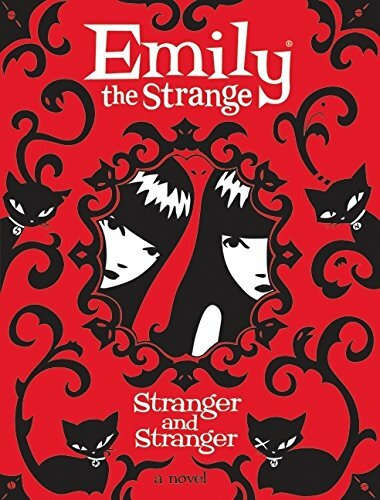 Emily the Strange: Stranger and Stranger is the second novel in a projected series of four books, not including the original graphic novels. The novels nod at their graphic novel roots with small illustrations on most pages. Some are supposed to be photographs, while others are the sketches Emily makes in her journal. The simple artwork is playful, expressive, and lovely. The publisher may be taking advantage of the rising popularity of books which are not graphic novels but rely on graphic elements, like the Diary of a Wimpy Kid series. These are typically aimed at reluctant reader boys (though Diary of a Wimpy Kid was a hit with girls as well). The language is advanced for reluctant readers, however. Will preteens know what a theremin windchime is, or understand a pun about enemas? Emily, the skateboarding, mad scientist prankster has qualities that would appeal to boys, but the conventional wisdom is that boys won’t read books about girls. Certainly most preteen boys wouldn’t want to be seen with the book. The dust jacket, which features inky black figures of girls and cats on a vivid red background, is striking but definitely targeted at girls. The book is written as Emily’s journal, and opens as she’s getting ready to move. She’s supposed to be packing, but instead finds ways to procrastinate. Many young readers will identify with Emily’s concerns about moving, but unfortunately she has no initial goal, so the story wanders at first and her complaining gets tedious. Emily is also mean and unfriendly. Part of her general philosophy of life is that “If there’s one thing that really spoils [fill in blank with anything good] it’s OTHER PEOPLE.” Loners may appreciate her sarcastic outlook on the world, but it can be hard to like someone whom you suspect would not like you. Fans of the first book or of the graphic novels will no doubt keep reading, but new readers may find it hard to get into the book. They may want to start with book one, Emily the Strange: The Lost Days, instead. In Stranger and Stranger, Emily would have more appeal if we got to experience more of her mischief and creativity at the start. We are told that she’s a master prankster, but we see only one example of a prank. We get a list of some of her inventions, and another list of her hidden routes through the neighborhood, but we don’t see Emily creating or using them. We don’t get to witness any of her supposed other talents, such as daredevil skateboarding and “virtuo-spastic” guitar playing. Her strangeness has little impact when we are just told about it. The story picks up after Emily and her mother move, and Emily gets her duplicator working. Through a freak accident, she duplicates herself. At first she is delighted to have an “Other Me” around, a friend who knows and understands her, but soon the trouble starts. Her mother is not pleased at having a second difficult daughter. Emily’s beloved cats now avoid her. Other Me tries to kill Emily in her sleep, blaming violent dreams. For a while the two keep working together on their elaborate Master Prank, a plan to turn the whole town strange. But Emily starts to realize that Other Me is not quite identical, inside, after all. Which is the real Emily? Can they coexist? The concept of having a truly identical twin, essentially a clone, will get many readers thinking. Would they want one? Could they really live with themselves? If they could keep only some of their qualities, which ones would they choose? What makes you you? Emily’s experience shows that having someone just like us might not be the joy it first seems. The story starts speeding ahead in the second half of the book. Readers won’t want to put it down as the disasters pile up, and Emily struggles to find a way out. The narrator half of Emily also gets more likable after the split. She doesn’t sound like a 13-year-old girl at any point, but she is supposed to be unusual. Secondary characters such as neighbor Venus Fang Fang are humorously unrealistic, drawn as quick caricatures who may yet have some surprises for Emily and the reader. Short journal entries and regular small illustrations help make the book a quick, easy read. The narrative is broken by regular lists of everything from possessions that are hard to pack to what her cats have to say through the cat translator. Each list contains 13 items, perhaps a poor decision as in some cases only a handful of the items are funny, and others could be cut. In addition, since the lists often don’t move the story forward, they slow the pace. Though the plot sometimes lags, the book is sprinkled with clever humor. Emily consults a Magic 8 Ball, which offers advice such as “Can’t someone else do it?” and “Why is a duck?” Emily also makes periodic suggestions that a certain phrase would make a good name for a band, such as Squeaky Boombox or Golem Circus. These tidbits, more than the plot, may be the series’ main appeal. Despite the book’s weaknesses, Emily fans will be delighted to see her again, and no doubt some new readers will want to join the fun. Chris Eboch is the author of many books for children including the Haunted series: The Ghost on the Stairs, The Riverboat Phantom, and The Knight in the Shadows (Aladdin).